Nikos has an extensive experience in banking for 23 years, on the island of Crete. Starting as a clerk and working his way up through the ranks of the leading banks to become manager of Millennium bank in Rethymnon. He is member of the organize committee of the Carnival in Rethymno (the 3rd largest in Greece ) organizing and running the core Cultural events . Hotel Owner , Project Manager and event organizer Nikos thrugh his Company Minoan Enterprises, will manage the operations and help to develop other locations ..
Peter is the Global Executive President Marketing & Sales at Vekoma Rides Manufacturing B.V. the leading manufacturer of coaster rides in the World. Peter has extensive experience and unrivalled relationships in the attractions market around the world. Peter will be the lead sales partner . Trained as an electronics engineer, Martin’s career moved quickly into international project management and operational management roles. He was headhunted into an international sales & marketing role at Barco, a £500m displays manufacturing business. He went onto become divisional manager responsible for 300 staff worldwide and £80m of sales annually. A short spell running his own technology design firm led to a full time role as operations manager and divisional manager for a UK based flight simulation company, which in turn led to Martin leading a private equity funded management buy-out to form Global Immersion in 2007. Within four years that firm grew sales from £2m to over £8m winning many international awards and accolades including IoD (Institute of Directors) regional director of the year and Gatwick Diamond international business of the year. He now runs his own technology services business TEQ4, based in Brighton, servicing international clients in the attractions business such as Walt Disney and Universal Studios. Martin will take on the role of CEO of VPort business and through his organization, deliver the innovative technology and media for VPort. With 10+ years in filmmaking with specialization in 3D animated films, Visual FX and digital content & media. 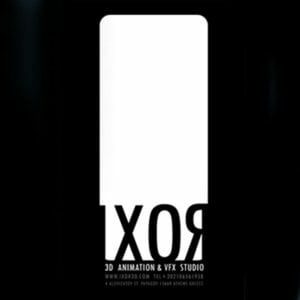 Established in 2005, IXOR Digital is a CGI and post-production company offering high quality Effects & 3D animation services. The main production house is located in Athens, Greece, with studio offices in London and Los Angeles. Our passion and hard work we have earned us several awards and accolades from our peers in the international CG community as well as Inernational known events. Andronikos Bisogiannis, founder & Crative director at IXOR has been nominated at the 2016 Guldabaggen Awards, the “Oscars” of Sweden. Awarded annually since 1964, the Guldbagge (“Golden Beetle”) is the name of the Swedish Film Institute’s award for achievements during the previous year. Bisogiannis is nominated in the “Best Visual Effects” category for the film “Cirkeln” (The Circle), produced by Abba’s Benny Andersson. Cirkeln is a Swedish fantasy film directed and co-written by Levan Akin, and is based on the best-selling novel by Sara Bergmark Elfgren and Mats Strandberg. Andersson was also in charge of the film score. Ixor produced the film’s visual effects. Headquartered in Kaohsiung, Taiwan, BROGENT is a diverse technology company, with rich experience in digital content creation. Our main lines of business include software and hardware R&D, manufacturing and system integration, theater design, planning and construction capabilities. We can deliver single subsystems as well as entire projects. After years of research and development, we are using our core technology and are combining it with the latest 3D dynamic simulation technology to produce simulation systems and game applications that provide a new generation of products for theme parks or large-scale amusement- and leisure venues. Our team members and partners include interdisciplinary senior designers and engineers, well known theme park designers and film directors. Thanks to our creative knowledge and engineering capabilities, we can use our virtual reality technology to turn your imagination into reality. Vekoma Rides Manufacturing is one of the largest roller coaster manufacturers in the world and a market leader in the amusement industry. Controlling and having the entire process in-house from (concept) design to engineering and manufacturing, of all types of coasters, such as family coasters, thrill and mega coasters and family attractions. The latest Vekoma Rides designs are characteristic for its innovation, high quality and durability, whereby special attention is given to the specific wishes of clients to custom design their attractions. With a wide product range, Vekoma Rides is responsible for supplying all time favorites such as the Junior Coaster, the Suspended Family Coaster, Boomerang, Suspended Looping Coaster, Flying Dutchman and many more. Vekoma’s latest innovative designs and developments like the Motorbike Launch Coasters, LSM and Hydraulic Launch Coasters, Flying Coasters and Mega Coasters, are driving the coaster industry of the future by setting new standards for quality and innovation. Vekoma Rides Manufacturing continues to focus on making rides appealing and accessible to a wide range of guests, so the entire family, from children to their parents and grandparents, can ride and enjoy the Vekoma Rides coasters and attractions.